Humble Bundle is back with a new game bundle, and this may be the best one we have seen for a long time. 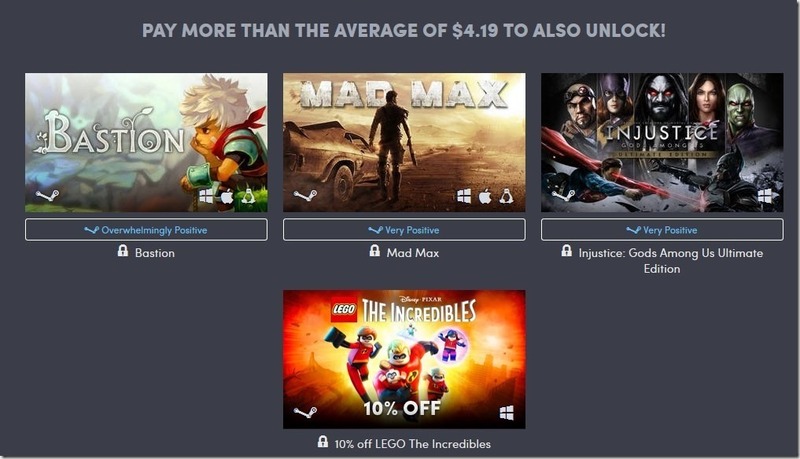 You can get 2 awesome open world games, and a cool puzzle game for $1. Is the bundle worth buying? Let’s tell you our opinion. Scribblenauts Unlimited is a fun puzzle game for kids. If you are a Lord of The Rings fan, you may love Shadow of Mordor. The reason we say "you may", is because the game doesn't follow the lore of the books at all. But it features incredible gameplay, which is sort of a mix between the mechanics of the Batman Arkham and the Assassin's Creed games. Every time you fail to kill an enemy Orc captain, i.e. if he kills you, he grows stronger, thanks to the Nemesis system. If you are looking for a few dozen hours of gameplay set in a Mordor landscape, you will love the game. Batman: Arkham Origins is perhaps the toughest in the entire series, but it is still a Batman game, and still an Arkham game. If you are a fan of the caped crusader and are up for the boss fights, this should be a no-brainer. Bastion is an RPG with platformer elements, and has a really cool soundtrack, and an even better story. Mad Max is like the movie (Fury Road), with a vast desert-like apocalyptic landscape. The combat is similar to the Arkham series' melee fights, but the game reminds us of Borderlands at times with the vehicle combat. And it is perhaps one of the best optimized games made for PCs. Injustice: Gods Among Us is a brawler game, similar to Mortal Kombat, except the characters are all from the DC Universe. So, if you are a fan of The Batman, Superman, Aquaman, Flash, Arrow, etc, this game is for you. Arkham Knight has one thing that the other games in the series don’t, the Batmobile, aka, the Tumbler. The open world gameplay is bigger, and the graphics too but it may be too demanding for some PCs. And the Season Pass unlocks a lot more including more missions based on the Batmobile. If you are on a budget, go for the $1 tier, you shall not be disappointed. Is the beat the average tier worth it? That depends on which game you find interesting, and the three of them are completely different. Is Arkham Knight worth $12? If you are a Batman fan, yes. If not, look at it this way. Will you be able to get all of these games at this price anywhere else? Probably not, so yeah we can recommend this one too. Not willing to pay for the games? You can still get something for free, because Humble Bundle is giving away free Neverwinter add-on content, that includes the Intern Starter Pack. It has a Ensorcelled Mulhorand Weapon, a Bag of Holding, and a Stone of Health. To get it, scroll down to the bottom of the Humble WB Games Classic Bundle page, and enter your email address.